I can cook, and I can bake, and I used to be a teacher… but I’m not always the craftiest of people. 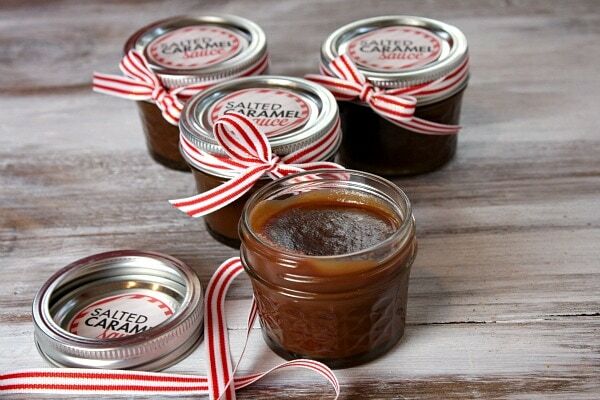 So I’m pretty proud that I successfully made some (cute) jars of Salted Caramel Sauce to give away as holiday gifts this year. This stuff should really be called Salted Caramel Crack. It’s a good thing that I made small jars of the stuff because once you open this baby, you’re going to want to eat the whole jar, and then (if no one is looking) you might be tempted to lick out the inside of the jar too. No kidding, man! Here’s a little peek at the preparation shake-down. It does not require a candy thermometer- just a watchful eye. Honestly I screwed up the first batch I made I guess because I cooked it too long… and it solidified before my very eyes. Eek! Take two, watching the mixture turn an amber color, I yanked it from the heat, finished adding the ingredients and let it cool. Perfect on the 2nd try. For my gift jars, I used 4-ounce jelly jars. You really do not need anything larger. A little of this stuff goes a long way. This recipe makes 4 jars. I made 2 batches- separately- since I wasn’t sure how it would work out if I tried to double the recipe. Once it is completely cooled, you’re ready for the lids and labels. My adorable cousin Gina just graduated from Rochester Institute of Technology, and she’s now doing web design, photography, graphic art, etc. 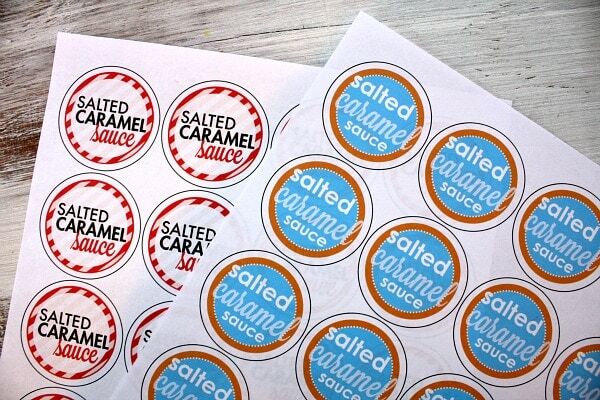 She’s available for freelance work 🙂 Gina designed my Salted Caramel Sauce labels- one especially for Christmas and one for any time of year. Thanks Gina- they’re super cute! 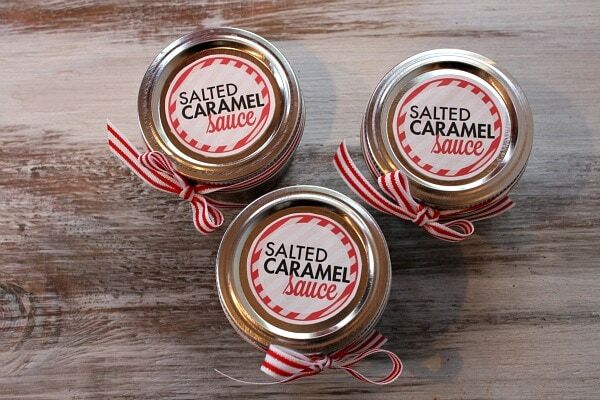 These labels are downloadable in .pdf form, printable here: Salted Caramel Sauce- Christmas Theme and here: Salted Caramel Sauce- Generic Theme . You are welcome to use these labels for your sauce, but please do not take the .pdf’s and re-print them anywhere else. 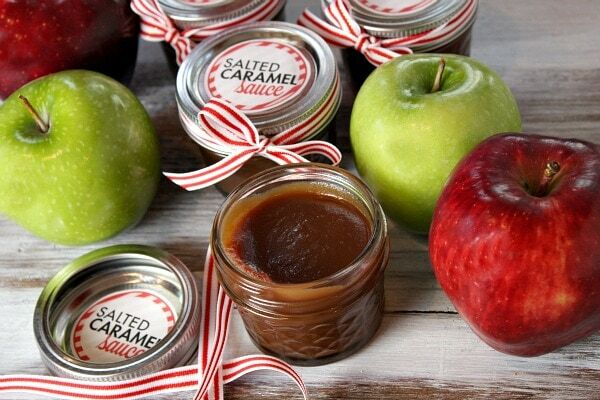 Link to here if you should decide to make salted caramel sauce on your own blog. Many thanks! The labels fit perfectly on the 4-ounce jelly jars- the labels are 2-inches in diameter. 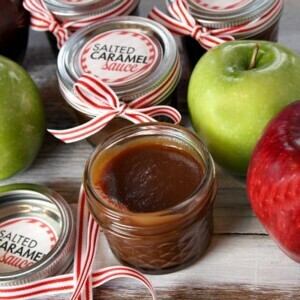 You can either print them on card stock, cut them out and tape them to the tops of the jars. Or you can just print on nice paper and do the same. Or you can get really fancy and buy some 2-inch round label stickers. I thought taping it on top worked just fine though. 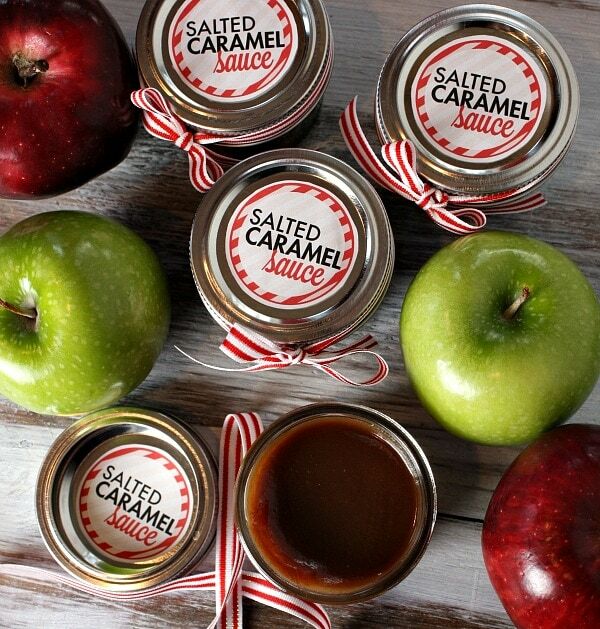 So what can you use Salted Caramel Sauce for? 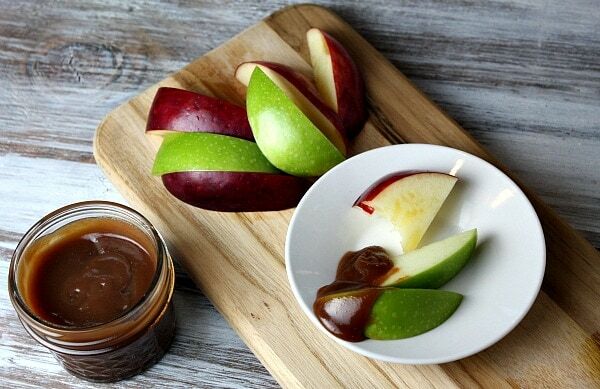 My gift idea is to put the jar in a festive box or bag, along with 2 red apples and 2 green apples for dipping. 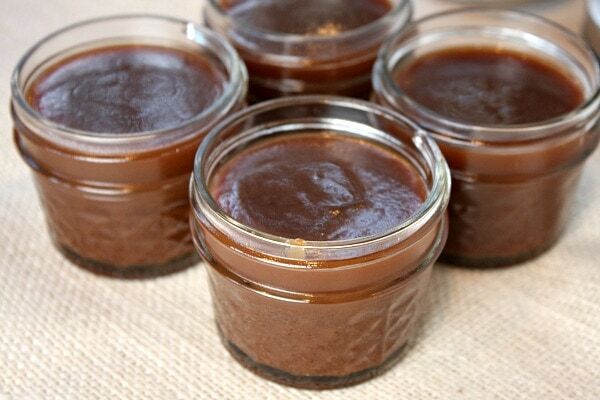 It can also be used as a dessert sauce for ice cream, and it would make a fabulous Salted Caramel Milkshake too. 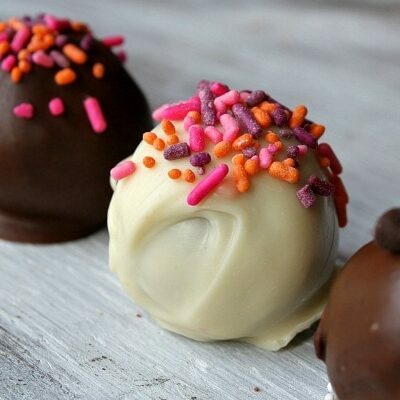 Now can’t you just imagine how delicious this must be? Yes, you’re imagining correctly. This is delicious. It’s caramel… with a hint of salt. This is what my neighbors will be getting for Christmas this year, along with a few apples. I figure it’s a nice little treat for their families to enjoy together. P.S. 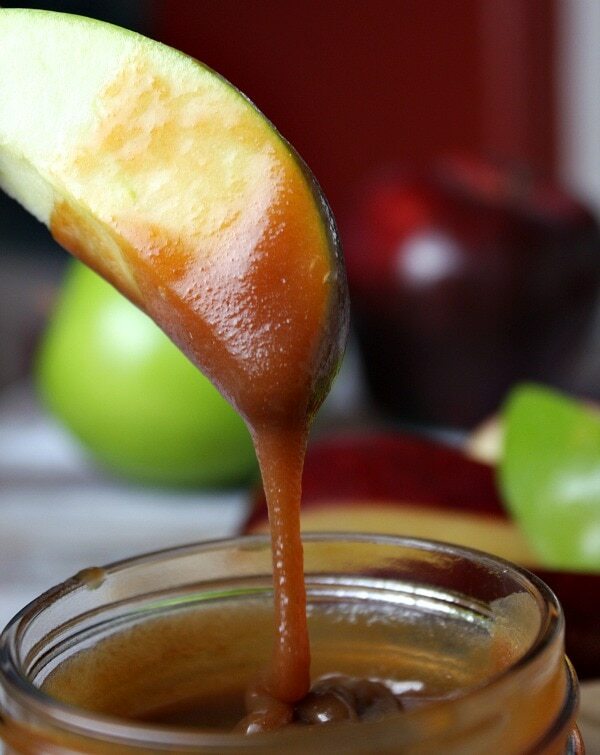 The sauce does need to be refrigerated, and it will stay fresh for 2 to 3 weeks. 1. Combine sugar and water in a medium saucepan over medium-high heat. Stir. Bring the mixture to a boil and shake/swirl the pan very often (don't stir it while it's boiling) until it turns a medium amber color (should take 12 to 15 minutes). 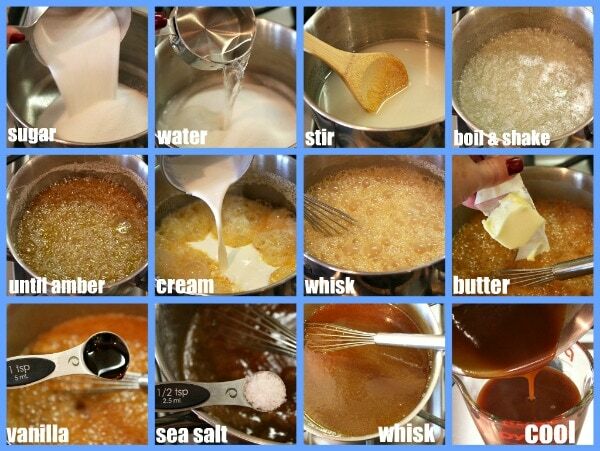 If sugar crystals gather along the sides of the pan during the cooking process, you can use a pastry brush dipped in water to brush the sugar down the sides of the pan so that it becomes incorporated into the boiling mixture. 2. Remove the pan from heat and pour in the cream. It will bubble up like crazy. Give it a whisk, then add in the butter, vanilla and sea salt. Whisk again until everything is nice and smooth. It should be the color of caramel. 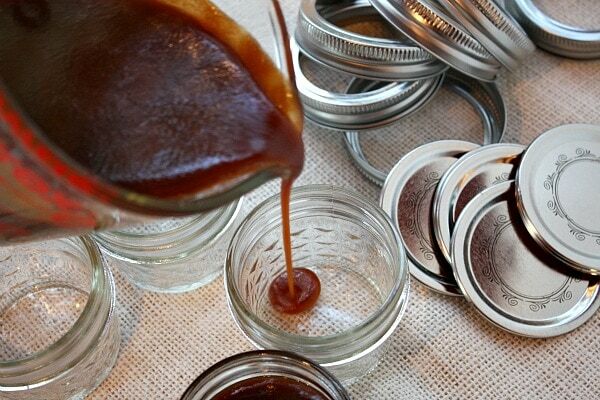 Cool it in the pan, or pour it into a large measuring cup so that it will be easier to transfer to jars when cooled. 3. Divide the sauce evenly among the four jars. Place lids and labels on and refrigerate until ready to use or gift to friends. The sauce must be kept refrigerated and it will stay fresh for 2 to 3 weeks. *I like to boil my jelly jars and lids for a couple of minutes to really get rid of any grime that might be in there from packaging. Then I just let them dry thoroughly before adding the sauce. *If your sauce solidifies (I speak from experience), you either let it cook too long or the heat wasn't high enough. Pull it off the heat when it is a nice, medium amber color. It's important that it maintains a nice boil at medium-high heat and that you don't take yours eyes off of it. Keep swirling the pan and don't let it burn! 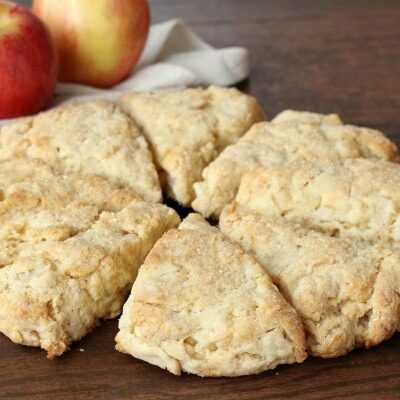 *Serving suggestions: Serve with apples, cheesecake, ice cream, or incorporate it into a milkshake! 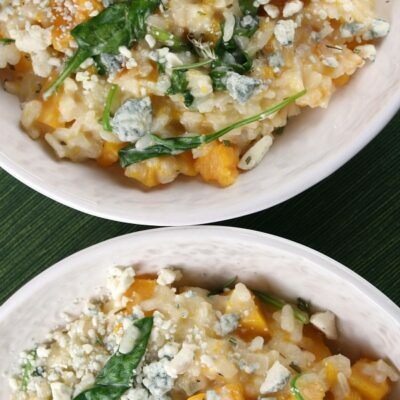 This recipe looks amazing and I can’t wait to try it! 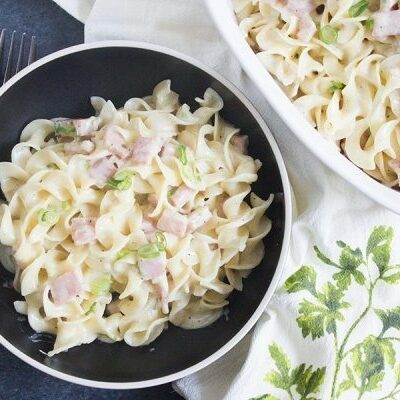 I would love to make it dairy free– any suggestions? Thanks! Love it! I would like to make this and use it as a wedding favor can it be canned and stored till Oct 2016 when its given out? I don’t think so… I think it would need to be stored using proper canning techniques. Feel free to send some to me!! I’ve got to try this ASAP. What a gorgeous gift! Loved it! It was the easiest gift ever and my daughters teachers loved it and have already asked for more!!! Took me longer to buy the jars and clean them than to make this sauce! Awesome! I have a question. I want to make this as a Christmas gift and ship it to family a few states away. I see that it should stay refrigerated, is it okay to ship it? I am in Michigan and I am shipping it to Louisiana. I have never made caramel so this is all new to me. I’m not sure if it’s the best option for gifting across states… because of the refrigeration needed.